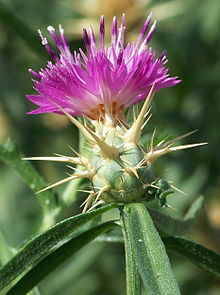 Centaurea calcitrapa is a species of flowering plant known by several common names, including red star-thistle and purple starthistle. It is native to Europe but is rarely found there, it is known across the globe as an introduced species and often a noxious weed. This an annual or Biennial plant growing erect to a maximum height of one to 1.3 metres. It sometimes takes the shape of a mound, and it is finely to densely hairy to spiny. The leaves are dotted with resin glands. The lowermost may reach a length of 20 centimeters and are deeply cut into lobes.